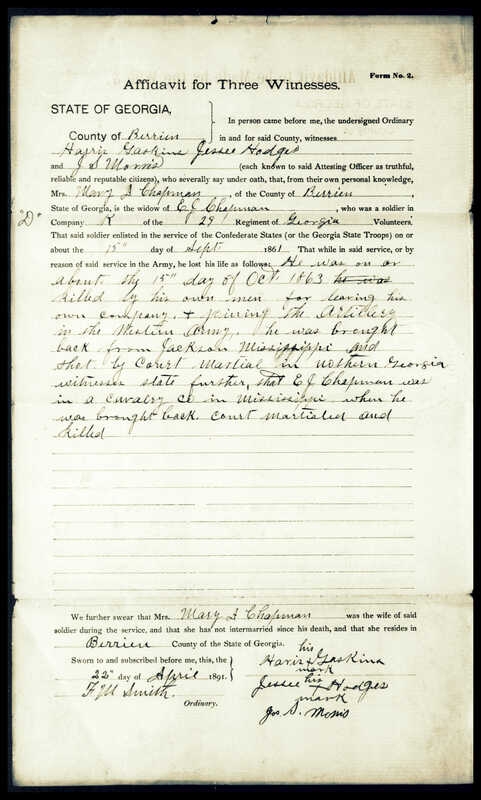 In 1891 Mary A. Chapman, widow of “Old Yaller” Elbert J. Chapman , was destitute and applied for a Conderate Widow’s Pension from the State of Georgia. The pension was denied on the grounds that Chapman was a deserter. Born Mary Ann Boyd in Lowndes County in the year 1836, she was a daughter of Aden Boyd and Nancy Sykes. Her parents were neighbors of Dred Newbern and Jonathan Sirmans. County deed records show that on February 22, 1839, Aden Boyd purchased land from Levi J. Knight. This land was a part of lot 356, 10th district of what was then Lowndes but now Berrien County. Her parents were Primitive Baptists, and her father donated the land for Empire Church, which was originally known as Boyd’s Meeting House. Mary Ann Boyd married Elbert J. Chapman in June of 1859. The application included an Affidavit made by the Widow Chapman. 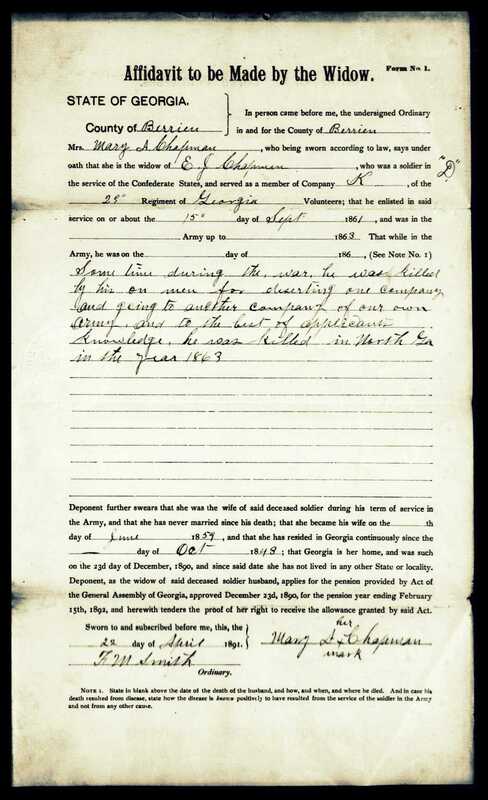 According to Mary Chapman’s sworn statement, E. J. Chapman enlisted in the Berrien Minute Men in mid-September, 1861. “Some time during the war he was killed by his own men for deserting one company and going to another company of our own Army, and to the best of applicants knowledge, he was killed in North Ga in the year 1863. This statement was corroborated by Harris Gaskins, Jesse Hodges, and Joseph S. Morris.